For over 40 years, CohnReznick has provided comprehensive services to assist government contractors with a full life cycle approach to winning and managing contracts. We ensure your financial and procurement processes are compliant, efficient and effective - so you can focus on what matters most, profitable growth. Our experienced team provides the highest quality advisory, assurance, and tax services, guiding contractors in a variety of areas throughout the lifecycle of a contractor. Our team’s significant experience performing extensive contract audits on behalf of civilian agencies, and industry exposure to government contract accounting and regulatory scrutiny, allows us to provide a unique perspective to our government contract advisory services. Our government contracting expertise is comprised of a deep bench of talented advisors that pay close attention to detail and provide hands-on solutions. Our specialized knowledge of contract matters, rate structure, and commercial/federal service mix are based on our real-world experience with the Federal Acquisition Regulation (FAR) and Cost Accounting Standards (CAS) to include CAS disclosure statements and cost impact calculations. Compliance with government regulations is not only non-negotiable, but it is required in order to be competitive in the marketplace. 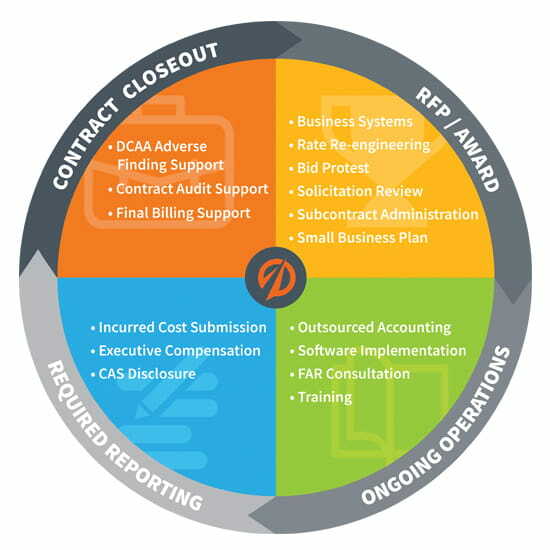 We provide compliance assistance in areas that include indirect rate analysis and structure, multi-tiered rate structure and review, provisional rate/billing rate development, proposal pricing, and executive compensation consulting. Having an adequate business system can mean the difference between winning federal work and not being allowed to bid. We proactively address federal regulations and avoid compliance issues through services that include pre-award surveys, business system readiness assessments and audits, policy and procedure development and providing annual required training. We can help businesses attain and maintain adequacy in accounting, estimating, property, and purchasing systems. Our transaction advisory and integration services go beyond the traditional due diligence support services with a deep industry focus. We review potential targets for government audit risk, potential claims, and compliance risk. In addition, we help on the sale side with waterfall, pipeline and other analysis requests. Post transaction integration services include indirect rate reengineering and restructuring for competitiveness, compliance assessment, business system and policy review, CAS disclosure statement updates /cost impact and how and when to integrate financial data into one ERP software. Our government contracting industry expertise is utilized by contractors and law firms to maximize cost recovery. A contract termination, or an actual or constructive change that fundamentally alters the scope of a contract, may result in financial implications for a government contractor. We cooperatively work with law firms, contractors, and in house counsel in termination and claim calculations, bid protests, and DCAA rebuttal support. We assist government prime contractors in successfully performing subcontractor oversight functions and advise on best practices for flowdown of contract clauses, oversight and monitoring, and subcontract audit requirements. In addition to proposal and business system audits, we also perform subcontract audits on behalf of prime contractors to enable timely close out and cost recovery of subcontract costs. There are many issues associated with optimizing an organization with disparate commercial and federal business interests within a single global enterprise. There also are multiple alternative approaches along with the respective advantages and disadvantages of each. We provide firms guidance on how to best navigate these approaches, remain compliant and maximize the use of commercial item determinations. At CohnReznick, we believe that a more informed client is a more successful client. As such, we offer a variety of educational programs and information briefs to our clients. Our interactive seminars, most of which qualify for continuing professional education (CPE) credits, are valuable networking vehicles. We also issue alerts and updates to our clients to assist them with staying abreast of current business issues and industry-related trends. These resources include our Government Contracting Lunch and Learn Series, industry-related webinars, onsite training, and our dedicated government contracting resource center, GovCon360.com.